Beat egg yolks until slightly thickened. Gradually add sugar and a pinch of salt. stirring. Add vanilla and pour into baking dishes. degrees for 45 mins to 1 hour. Test with clean knife. place under broiler to make a hard shell. I must thank "Anne" for another fab recipe. Beat together for three minutes. at 375 degrees for 13-15 minutes. Cool one minute. off wax paper and roll up. Let cool in refrigerator. Beat all together and mix well. 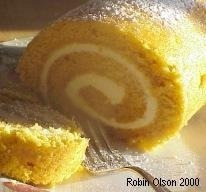 Unroll cooled cake. Spread with filling. Roll back up and refrigerate. Put one Rolo on top of each pretzel. Bake at 250 degrees for 4-5 minutes or until the candy is soft. 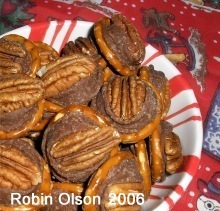 Remove from oven and quickly put a pecan on top of softened candy, push down and squish the chocolate into the pretzel. Let sit out and cool for 10-15 minutes, the put baking sheet in fridge to harden the candies. Store in sealed container --if there's any left!! The 'hardest part' of making this treat is taking the wrappers off the rolos. So easy, yet so good! (My mother made this when I was young. Mix butterscotch and peanut butter. Pour over remaining ingredients; stir until coated. Drop by teaspoons onto a cookie sheet. Chill until set. Top w/ cherries. Makes 48 candies. Cream shortening, sugar, orange peel & vanilla add egg & beat til light & fluffy stir in milk sift together dry ingredients & blend in cream mixture. Divide dough in half, chill one hour. 6-8 minutes in 350 oven. Mix sugar, cornstarch and salt. Add milk and sugar mixture to rice. Heat to boiling; boil 1 minute, stirring constantly. Separate eggs (whites will not be used) and beat yolks. into the beaten egg yolks in a bowl. Blend with the remaining mixture in saucepan. just until mixture starts to bubble. Variations: chocolate (powdered), pecans, walnuts, different flavors of extracts; ie, mint, rum, lemon, almond, orange. Add water, sugar, corn syrup together in a sauce pan. Cook slowly, over low heat and stir until dissolved. mixture holds its shape and "fights the mixer". Add vanilla and anything else you might want. Mix until combined. Drop from a greased teaspoon onto wax paper. Allow many hours to dry completely. --a good ole 'Southern Treat! Instructions: Mix together 1 egg, milk, butter. In another bowl sift dry ingredients. Hand mix wet and dry ingredients, add apples. Drop a tablespoon into hot oil, approx. 375 degrees. wait a minute, then remove. Combine both sugars and cinnamon in a bowl with a whisk. Melt butter in a sauce pan and add to the sugar mixture. Stir over medium heat until melted, done when it starts to bubble. Toss pecans into the sauce, stirring to coat them well. Remove pecans using a slotted spoon. Spread on wax paper, let cool. Cream shortening; beat in sugar, eggs, one at a time; beat well after each addition. 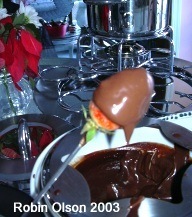 Make paste of the cocoa and food coloring; add to creamed mixture. Add salt, flour and vanilla alternately with buttermilk, beating well after each addition. Sprinkle soda over vinegar; pour vinegar over batter. Stir until thoroughly mixed. Bake in 3 8-inch pans or 2 9-inch pans for 30 minutes at 350°. Let cool completely. Cover with frosting. Mix butter, 2 cups flour and confectioners sugar. Pat into a 13x9x2-inch pan and a 350° oven for 20 minutes or until light brown. To prepare second layer, beat together eggs, lemon juice, sugar, flour and baking powder. Pour over baked crust. Return to oven and bake at 350° for 25 minutes or until liquid does not move when the pan is tipped. It should have a golden crust. 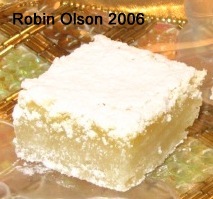 Let cool slightly then sift confectioners' sugar over the top while warm, cut into bars. A pint of heavy cream in a pot on the stove, medium heat. One bag of good gourmet chocolate chips. Don't use Toll House, buy the best brand of chocolate you can find. I also added Ghiradelli Coco powder. Stir constantly until melted, transfer to fondue pot. Serve with fruit and pound cake. Bake a Valentine Cake for your loved one! This is a picture of a Black Forest Cake my son David made me in 2001, when he was 18. It was the sweetest, most delicious cake because of the love that went into it! Bake at 350 degrees F for 35 to 40 minutes, or until a knife inserted comes out clean. Cool completely. Remove paper from the cakes. Cut each layer in half, horizontally, making 4 layers total. Sprinkle layers with the 1/2 cup Kirsh. In a medium bowl, cream the butter until light and fluffy. Add confectioners sugar, pinch of salt, and coffee; beat until smooth. If the consistency is too thick, add a couple teaspoons of cherry juice or milk. Spread first layer of cake with 1/3 of the filling. Top with 1/3 of the cherries. Repeat with the remaining layers.